I’m sure I have sprayed 20+ different waterborne topcoats the last 6-7 years. Several of which I’ve sprayed well over 50 gallons of! Most of which was on corporate or commercial projects. As with most things, there are things I like and dislike about all of them. About a year ago I decided to try emtech. Jeff (owner, target coatings) suggested I use 8000cv. I had yet to shoot a waterborne conversion varnish that I liked so I went with 9300 instead. After a short learning curve I became fond it, although it can picky about how its used. 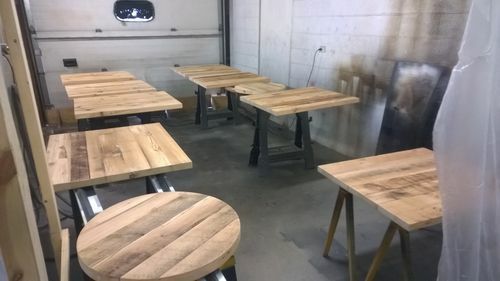 One of my big clients ask me to make them some walnut tables finished with EnduroVar, so I did. 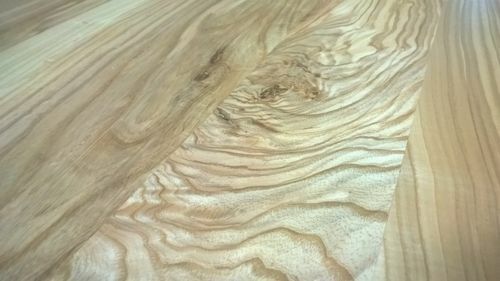 EV has a beautiful color to it, but I found it’s not a high enough quality product for commercial tabletops. With that I decided to try EM8000cv. I spray using a Fuji Mini-Mite 4 with their T70 gun (great system btw). With this setup I was instantly happy shooting 8000cv. It took very little playing to get it to work good. This stuff shoots nice, lays down great and feels very good to the touch. You do need to strain it, and I run water through my gun after every coat (gun held upside down under faucet till stream runs clear). And on that note, this stuff has to be the easiest stuff I have ever cleaned out of a gun. Bonus! Did I mention durability yet! Oh yes, it’s durable! 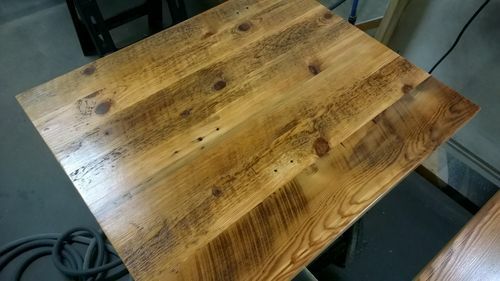 I had some epoxy leach out of some knots on an ash table. I was able to soak those spots enough with denatured alcohol that I could scrub and pick all the bad epoxy out WITHOUT effecting the finish! I was blown away! I have a walnut table in my office that has only 2 coats of 8000cv on it that I have abused as a test piece for a good 6 months, and it looks like the week after I shot it! I highly recommend this product (as well as Target Coatings in general) for anyone that sprays on their topcoats as it is the best product I have used! Thanks for the post. The only water-based product I’ve sprayed is Sherwin Williams Kem-Aqua. That stuff is nice, but doesn’t lay as smooth as I’d like. Maybe I’ll give this a shot. Did the EM8000cv give those tables the yellow oil color? Yes. These are just 8000, no color added. The only thing I’ve found that is easier to shoot is GF Enduro poly, but it doesn’t have great durability. Drew, I am just a hobby woodworker, but I have been using Target’s products for over 6 years, primarily EM6000. I agree with all you said and will add that I have never had a problem with blushing and sanding between coats is minimal to non-existent. 6000 is good stuff too. I use it when I need true water white, like over painted furniture and between paint colors. And with a coupon code you can’t beat the price! Drew, I am just a hobby woodworker, but I have been using Target s products for over 6 years, primarily EM6000. I agree with all you said and will add that I have never had a problem with blushing and sanding between coats is minimal to non-existent. I am a hobbyist and dont use a lot of topcoat products but I started using WB about 5 yrs ago. Based on research I chose Target Coatings. I have used a few other WBs from the bbs and There is no comparison to Targets products. While I dont have personal experience with other higher end WB topcoats I see more of these comparisons where Target comes out on top. Ive used em6000, 2000, and 9000. Based on Targets data and my experience, and low volume use, I chose to continue using the 6000 and 9000. Both provide water clear clarity and can be tinted to get amber/yellow look of oil finishes. Targets WR4000 is an excellent stain base that can be tinted with Transtint. Nope. ^95% of waterborne topcoats dry to fast to wipe on. I’ve heard of a few through the years but haven’t tried any of them. Yes they can using the available retarder on smaller projects. They are best applied with a foam brush vs wiping. It’s really best to spray them. Unless you are looking for a non-yellowing finish, stay with oil based poly for wiping. 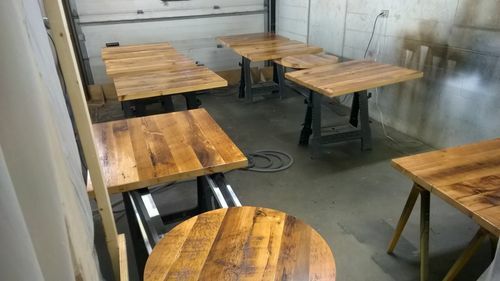 I’m no expert, but with GF waterborne poly, I can brush or use a pad on smaller surfaces or vertical surfaces, but it you have a larger flat table top or the like, you have to spray to get it really nice. You mention that you shoot this stuff over paint? I am looking to do something similar to a vanity I am finsihing up right now. I would like to shoot it with white paint and then use 6000 over it to protect it. What kind of paint would you recommend I use? I am new to spray finishing so any tips you could provide would be appreciated. Instead of painting it white, consider using the white lacquer. I have used the black and it’s awesome stuff. It doesn’t get gummy like paint and dries in an hour.